Efforts to address environmental and social risks are obviously more effective when many companies join forces. This is why we are keen to further promote sustainability risk management within the re/insurance industry. In 2016, our sustainability risk management unit decided in 20 SBR assessments to proceed with conditions. In most cases, these conditions required the particular underwriter to engage with the client on specific questions about human rights issues or environmental protection, in line with the requirements of the Ruggie Framework. In addition, we engaged with strategic clients that have a comparatively low sustainability performance. This open dialogue allowed us to explain our own positions on human rights and environmental protection, and draw attention to specific practices we consider problematic. On an industry-wide basis, we have played a major role in establishing and advancing the Principles for Sustainable Insurance (PSI) introduced in 2012 by the UN Environment Programme Finance Initiative, UN EPFI (www.unepfi.org/psi). We were one of the initiative’s original signatories and currently act as one of its board members. The PSI address environmental, social and governance (ESG) issues in the re/insurance industry, spanning risk management, underwriting, product and service development, claims management, sales and marketing, and investment management. Our Public Disclosure of Progress for 2016 is included in this report in PSI – The Principles for Sustainable Insurance. Two years ago, we partnered with the UN Environment Programme (UNEP) to co-host a roundtable on “Insurance 2030: Policies and partnerships for sustainable development” at our Centre for Global Dialogue near Zurich. Around 60 leaders and executives from re/insurance companies and regulatory bodies, the UN, governments, think tanks and civil society reflected on the policies and partnerships needed to realise the full potential of re/insurance in promoting sustainable development. In 2016, we participated in a practical follow-up event held in Munich, entitled “Insuring for sustainable development: Making it happen”. Its key objective was to assess and discuss progress on the initiatives launched after the 2015 roundtable to further mainstream sustainability across the insurance value chain. We also participated in the UN Forum on Business and Human Rights in Geneva where we presented our Sustainability Risk Framework and explained the fundamental role that the principle of respecting human rights plays in the way Swiss Re does business. The event provided a valuable opportunity to bring various stakeholders together and gain further insights on our approach. Supporting our efforts to promote best practices in sustainable risk management, we updated and expanded our publication on the Sustainability Risk Framework in 2016. 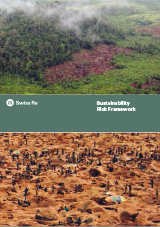 The revised version of our publication on the Sustainability Risk Framework explains how we define such risks, provides a detailed description of the framework’s policies and guidelines, and illustrates how we apply these in practice.